Sunday, June 30, 2013, from Gettysburg National Military Park, Howard Coffin spoke about the Battle of Gettysburg, which took place July 1-3, 1863, and is considered the bloodiest battle ever on U.S. soil. He talked about Union General George Stannard’s Vermont Brigade, who were untested in combat and had reached Gettysburg with their nine month enlistments nearly expired, yet launched the flank attack that put an end to Pickett’s Charge. A signal loss of approximately 13 minutes occurred during the middle of the program. The talk, “The Vermont Assault on Pickett’s Charge,” took place during an event commemorating 150th Anniversary of the Battle of Gettysburg, sponsored by Gettysburg National Military Park and the Gettysburg Foundation. Streamed video on C-SPAN3. Howard makes frequent appearances on Across the Fence, shown on WCAX-TV. Here are a few episodes. 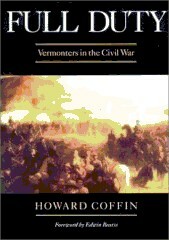 Learn about Author Howard Coffin’s new book “Something Abides: Discovering the Civil War in Today’s Vermont”. Hear Coffin talk about Vermont’s role in the Civil War and visit several Civil War historical sites highlighted in his new book. Article by Candice Page about Something Abides. “If you want to see and understand the Civil War home front in a beautiful setting, there is no better place than Vermont,” Coffin said as he conducted a recent Civil War driving tour of Chittenden County places. Coffin is a frequent commentator on Vermont Public Radio, often on topics relating to the Civil War. Talks can be heard on the VPR website’s Commentaries Archive.